I could go on and on (and on)...but you get the gist. Kotler was ahead of his time in the world of marketing, coining principles like "marketing is meeting needs profitably" long before the concept of inbound (essentially the same thing) was ever born. His latest book, My Adventures in Marketing: The Autobiography of Philip Kotler, is funny, thoughtful, exposing and brilliant. If you haven't read it, I highly recommend it. It is no longer enough to satisfy your customers. You must delight them. 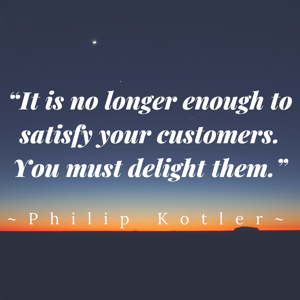 Kotler makes a brilliant point here, in that you can't just give customers what they want and be done. Sell bicycles? Great. Customer walks in needing a bike? Awesome...you have many. But your work is far from over here. In fact, I would argue that this missed opportunity (to make effort to delight your customer base) is the reason so many brands will fail. We live in a world where customer service is virtually dead, the customer is no longer "always right" and consumers have the whole-internet-worth of research at their fingertips (complaints, rave reviews and all). So to merely just offer what they're looking for will get you nowhere. And fast. Delighting your customers means they'll not only remember you, but they'll tell others about you too. Think it doesn't matter? I'll leave you with this. When was the last time you were truly impressed by a brand? How many people did you tell? Have you been back? You may not even recall the last time you were really, honestly blown away...dare I say "DELIGHTED" by a brand. Imagine if they delighted you. Loyalty for life...this is such a basic, no-brainer, simple (but not always easy) way to set yourself apart. And the brands that do it? And do it well? They'll tell you wholeheartedly that Kotler is right on the money. Do you need help figuring out when, where and how this "delight" factor fits in to your customers' journey? It's a fundamental part of the inbound methodology, and Flair can show you not only where this fits into your marketing plan, but also how to implement it. Reach out to us today to learn more about how we've been delighting our customers (and showing them how they can do the same) for more than two decades.